Cross axle diff locks are undoubtedly one of the best go-forward aftermarket accessories you can add to your 4x4. Sure, good rubber and suspension, as well as increased power and driver ability all help, but throwing in a set of lockers takes any 4x4 to a whole new level of capability… especially on a non-flexing Troopy like mine. Not that the rear leaf and front coils don’t flex at all, it’s just that they are no match for a super-flexy custom coiled job. Given the relative lack of articulation, a set of lockers will help in not just suspension flex situations, but also lack-of-grip driving like mud, snow, uphill, downhill and yep… even sand driving will see some benefit, albeit generally less than other track surfaces. I’ve opted for a set of Harrop Eaton E Lockers for my (hopefully) 10 year plus project. No, they are not a new mob; rather, Eaton is a proven American based company that has been around for donkeys years, while Australian specific models have been developed via Melbourne based Harrop (who also specialise in all things superchargers and racing driveline components) and sold via Opposite Lock and Terrain Taimer outlets. 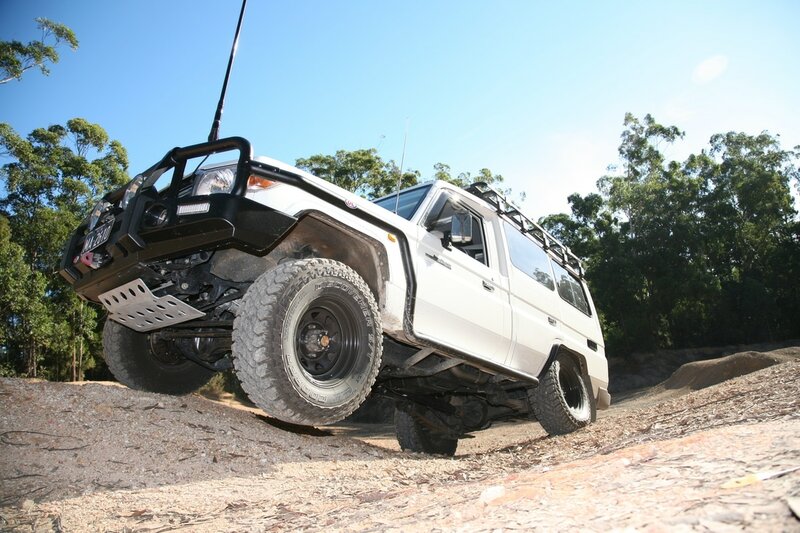 The E Locker is manufactured with precision-forged gears and 4-pinions providing superior strength and durability over standard equipment and most Australian sourced 4x4’s have offerings of both front and rear lockers. Let’s get one thing straight about differential locks; you do not have to be a weekend warrior, rock-hopper or off road racer to enjoy the advantages that lockers offer. No siree, your average old tourer, family 4x4 and long distance adventurer (me and my Troopy fit into these tree categories) will see just as much bang for their buck with the use of a ‘get-out-of-the-muck’ free card that a locker offers. Heck, even trying to haul your boat trailer up a slippery ramp can be made so much easier at the flick of switch… provided of course you don’t ‘wind the diff up’ using it too long on a hard surface. The more difficult the terrain you drive, the more you’ll enjoy the benefits of a diff lock, keeping in mind that if you do get stuck with a locker (or two) engaged, it’ll probably be a massive recovery effort given the extra go-forward drive they offer. Once the locker unit is installed into your diff centre, which realistically, is not much different install time too many other manually switched lockers, all there is to run is a pair of wires to each diff. The E Locker is an electromagnetic activation, which is manually switched in-cab by the driver. Flick those buttons and you have instant satisfaction knowing all wheels will continuously drive until you’re confident you can revert back to un-locked diffs… which again is instantly unlocked by those same switches (one for the front and one for the rear locker) for open diff driving. Lockers can also be used to help negotiate and tackle obstacles slowly without damaging your 4x4. Instead of using momentum and crashing over rocks or ruts, you can more easily select a low gear and crawl over (almost) anything without the (possible) resultant damage, plus you look like a cool-calm-hero to the kids by being able to ‘drive’ anything! Simple: One is great, but two is even more greater (better, superior, or whatever other grammatically correct word you want to throw at it) - but care must be taken when locking the front locker as you do loose steering ability as you ‘power on’, with tendencies to want to pull your 4x4 straight ahead. One great option with the E Locker pair is that you can use just the rear, just the front or both at any time – it’s your choice. While, E Lockers can be fitted by competent DIYer’s or most mechanics, I opted for the professional services of Opposite Lock South Sydney to install mine as I knew they had all the required specialty tools on hand. They have ensured all settings are correct within the diff housing, plus used a Terrain Taimer bearing kit as well as undertook a general ‘look over’ during the installation. Simple electrical lines are run from the in-dash switches to each diff. I’ve inserted the two switches within easy reach just to the right of the steering wheel, slotted into existing ‘push-outs’. While I’m reveling in the ‘go-anywhere’ ability that the E Lockers provide, I am also aware of not pushing the limits of gravity with such a tall and narrow 4x4. But, when the Troopy struggles for traction, I’m confident that at the push of a button (or two), I’ll have the ultimate, 100 percent four-wheel traction to help pull and push the Albino Behemoth over and through pretty much anything in my path and can revert, just as quickly, back to unlocked open diff centres for on-road mile munching - that’s a win win all ‘round!